As I wrote about yesterday, this past weekend I got to join some of the most prominent movers and shakers in DSLR filmmaking world as Shane Hurlbut and Letus revealed their latest edition to the camera rig game: the Master Cinema Series. Today I want to give you my initial thoughts and feedback. The only part of the event set-up that I wasn’t too crazy about was that for the fish eye dolly set, the model was a lingerie-clad woman lying erotically on the velvet sofa. Personally, I didn’t think they had to go there. Now, what would have been great and more entertaining IMHO would have been if they got a hirsute, George Costanza look-alike in boxers and dress socks to do the same. That would have been hilarious and the talk of the event. The gear itself is specifically designed to make DSLRs work for DPs and camera operators in a way that Shane felt current systems didn’t offer. The first thing I noticed when trying on the shoulder mount was that it was much lighter than it looked (you’ll notice in the video below that YouTube star Freddie Wong makes the same observation). Secondly, the thick, leather padding was very comfortable on the sholder. The camera cage is designed so that the camera can be powered with a traditional battery, or with an external battery source you might use with Anton Bauer. The EVF (electronic viewfinder) can be easily adjusted to fit your needs. There’s a quick release plate at the bottom of the shoulder rig, but it won’t fit on the smaller, lower-end tripods. This system is designed with Hollywood DPs in mind, so the tripods the current iteration of the system is designed to work with are much larger cinema sticks. It’ll be curious to see if Letus has plans to create a version that can fit the smaller tripods. 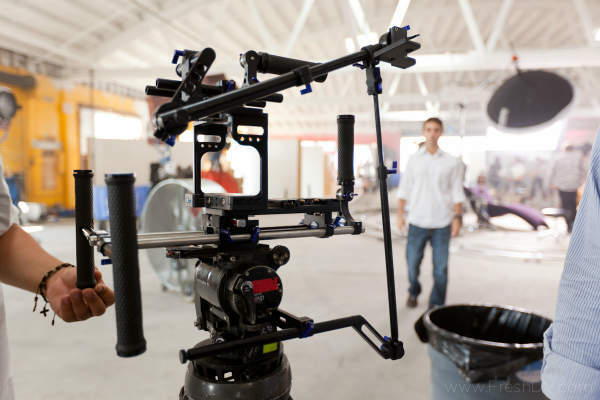 The question you’re asking yourself now is probably: “do we need another DSLR rig system?” That’s a good question. The design of this particular system was born out of Shane’s experience with current systems during the filmming “Act of Valor” (which I believe was shot entirely with the 5D Mark II.) He worked closely with Letus for five months on the design, so I’m sure there are tweaks that he found best suited his needs as a DP. Based on my limited amount of time I had to play with various set-ups, my take is that this is best suited for indie filmmakers or Hollywood “big boys” who want to use the DSLRs but need something that closely matches the feel and usability of the traditional gear they’re used to. One example is the “studio cam” set-up (with the eye-piece leveler) which is a particular addition from the more common rig systems I’ve seen. I don’t know if there’s a big enough difference in this system and the ones out there to make those of you married to your current system change. But if you’re in the market for a new system, this is definitely a contender. Pricing will range from $1,400 to $6,400 for the various components. That’s straight from the head of LetusDirect. The $6900 price Shane mentions in the video is for the entire system. Another question that may be on your mind is “Is this rig future proof?” We know Canon has a big announcement to make on November 3, and the talk in the industry is that it’s some kind of new camera. It may seem foolish to come out with a new rig so close to a major announcement. My guess is that considering Shane is a Canon Explorer of Light filmmaker, whatever it is Canon announces next month, this rig will fit it. If you can’t see this video in your email or RSS reader, click here.